PLEASE NOTE THAT THIS OFFERING HAS BEEN CANCELLED. Brooklyn Zen Center will be having a half-day introductory sit on Sunday, November 18, from 10 a.m. to 1 p.m., led by Shokuchi Deirdre Carrigan. The doors will open at 9:30 a.m. This special sit is geared toward beginners and will feature 30-minute meditation periods, walking meditation, discussion, and short talk. All are welcome. There will be ample time for questions and responses. Registration closes November 14 at 11:59 p.m. Please click here to register. Partial scholarships are available for sitting retreats such as this one. To apply for a scholarship, please use this link and wait for approval before registrating for this retreat. Scholarship applications are due by November 9 at 11:59 p.m. Please note that by our cancellation policy, we do not offer refunds for this event. 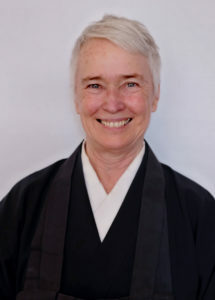 Shokuchi Deirdre Carrigan currently serves as the BZC Tanto (head of practice). Shokuchi received training in Soto Zen practice as a resident of San Francisco Zen Center for 12 years, was ordained as a priest in the Shunryu Suzuki lineage by Tenshin Reb Anderson in 2010, and served as head monk (shuso) in 2014. She has taught yoga in the San Francisco Bay Area since 1988, as well as co- leading Zen and Yoga retreats at Tassajara and Green Gulch Farm since 2002.